The Rays scored on an error in the bottom of the eleventh inning to beat the Red Sox 4-3 at the Trop. What should have been an inning-ending ground ball turned error when reliever Heath Hembree couldn't handle Travis Shaw's flip on a two-out ground ball. Luke Maile scored the winning run on the play. David Ortiz put Boston ahead in the top of the first with his 30th home run of the year, driving in Dustin Pedroia in the process. It's the tenth time in his career that he's reached the 30 home run/100 RBI mark. Mookie Betts made it 3-0 with an RBI single in the third driving in Pedroia. The Rays narrowed the gap to 3-2 on a two-RBI hit by Brad Miller. Even Longoria tied the game in the eighth with a solo home run. 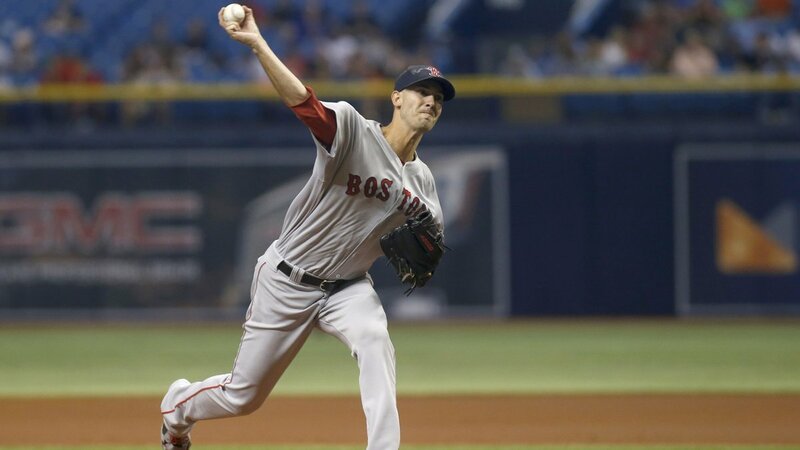 Rick Porcello (pictured) started for Boston and went 7.2 innings, giving up three runs on nine hits. He struck out eight and did not walk a batter. Andrew Benintendi left the game in the seventh inning with what appeared to be an ankle injury but was later determined to be a left knee sprain.